Definition at line 315 of file algebra.h. Definition at line 322 of file algebra.h. Definition at line 325 of file algebra.h. Definition at line 328 of file algebra.h. Definition at line 331 of file algebra.h. Definition at line 334 of file algebra.h. Definition at line 337 of file algebra.h. Definition at line 340 of file algebra.h. Definition at line 343 of file algebra.h. Definition at line 346 of file algebra.h. Definition at line 349 of file algebra.h. Reimplemented from AbstractRing< T >. Definition at line 352 of file algebra.h. Definition at line 355 of file algebra.h. Definition at line 358 of file algebra.h. Definition at line 361 of file algebra.h. Definition at line 364 of file algebra.h. 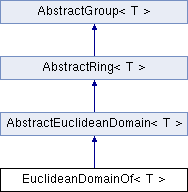 Performs the division algorithm on two elements in the ring. Definition at line 367 of file algebra.h.